On Launch Pad 39A at NASA's Kennedy Space Center in Florida, workers prepare to remove the seal from the Ground Umbilical Carrier Plate, or GUCP, on space shuttle Endeavour's external fuel tank. A leak of hydrogen at this location during tanking June 12 for the STS-127 mission caused the mission to be scrubbed at 12:26 a.m. June 13. This story was updated at 3:29 p.m. EDT. 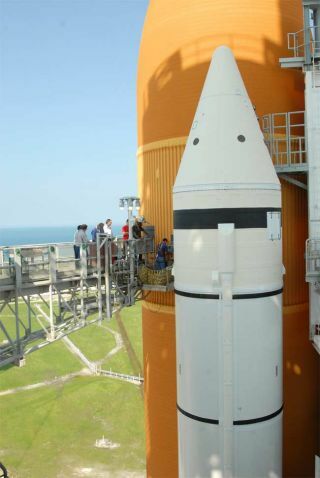 NASA has delayed a high-priority moon mission to make wayfor the space shuttle Endeavour to launch Wednesday. The shuttle was originally intended to blast off June 13toward the International Space Station, but was thwarted by a potentially dangeroushydrogengas leak from a vent line off its external fuel tank. NASA thinks it can fixthe leak in time for a Wednesday liftoff at 5:40 a.m. EDT (0940 GMT) fromLaunch Pad 39A at Kennedy Space Center in Cape Canaveral, Fla.
"The repair work is going well," NASA testdirector Steve Payne said today at a briefing. "We expect to have all thework completed by 3 p.m. [EDT] on Tuesday afternoon. Our teams have been workingvery hard over the last couple of days to get this piece of equipment fixed." This timeline will push back the planned flight of a pair ofunmannedlunar probes which were scheduled to launch the same day from the nearby CapeCanaveral Air Force Station. NASA decided to give Endeavour another chance tofly before its window to align with the space station closes. The weather for Wednesday looks favorable for the shuttlelaunch, with an 80 percent chance of "go" conditions, shuttle weatherofficer Kathy Winters said today. A slight chance of clouds poses the onlyweather threat to liftoff that day. "I do have good news for launch," Winters said. "Weatheris overall favorable." The lunarspacecraft - the Lunar Reconnaissance Orbiter(LRO) and the Lunar CRater Observation and Sensing Satellite (LCROSS) - willnow aim to fly as early as Thursday at 5:12 p.m. EDT (2112 GMT), NASA launchdirector Chuck Dovale said today. If the shuttle must cancel its Wednesday launch attempt atany time before midnight on that day, the moon probes can likely fly Thursday.If Endeavour succeeds in gettingoff the ground, LRO/LCROSS may launch either Thursday or Friday. "Exciting times on the space coast," Dovale said. Even if Endeavour is unable to lift off for any reason onWednesday, the shuttle management team has agreed to stand down until July 11 and let the lunarmission proceed, as that launch has already been delayed about eight months forvarious issues. The leak problem plaguing the space shuttle is not new; asimilar problem stalled the launch of the shuttle Discovery's STS-119 flight inMarch. That mission ended up blasting off four days later than planned afterground crews swapped out the suspect seal between the vent pipe and theshuttle. NASA hopes a similar fix on Endeavour will do the trick. Though switching out the faulty seal has resolved theproblem in the past, no root cause for the leaks has been discovered. "The only thing that we've seen is evidence of a littlecompression, probably caused by the fact that [the seal] was a little misaligned,"Payne said. "What's causing the misalignment is probably what we reallyhave to go after." Endeavour is slated for a 16-day mission to deliver thefinal segment of the Japanese Kibo laboratory to the space station, as well asdrop off a new long-duration station crewmember, NASA astronaut Tim Kopra, whowill replace Koichi Wakata of Japan. Wakata is due to fly home aboardEndeavour. Endeavour's commander Mark Polanksy plans to lead his crewof seven through a series of five challenging spacewalks and complicatedrobotic maneuvers to install the new lab section as well as a horde of spareequipment for the station. SPACE.com is providing continuous coverage of STS-127with Staff Writer Clara Moskowitz and Senior Editor Tariq Malik in New York. Click here for missionupdates and SPACE.com's live NASA TV video feed.